The Blue Unicorn Tang are also known as the Spotted Unicornfish. The Blue Unicorn Tang is silver as a juvenile and will gradually darken into a black and blue coloration with age. Their shape also changes from being oval as a juvenile, to a long, bullet-like shape as an adult. 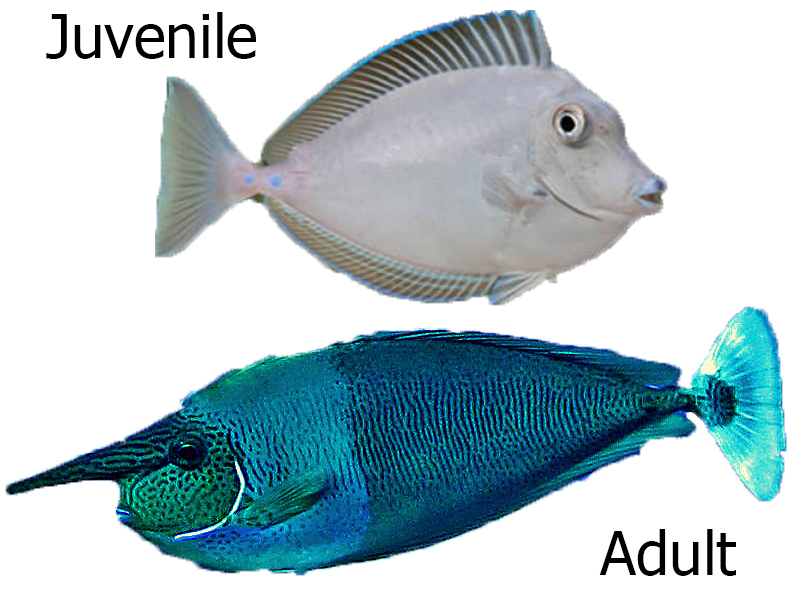 These tangs also develop a long horn on the nose when they enter adulthood. To be successful with a Blue Unicorn Tang a well-established 300 gallon or larger aquarium with plenty of live rock is necessary to provide plenty of swimming room, places to hide and graze upon. The Blue Unicorn Tang is aggressive towards its own species, but peaceful with other fish, this fish should not only do fine, but be a highlight in even the largest of tanks. Q: What is the size of this fish that is for sale?